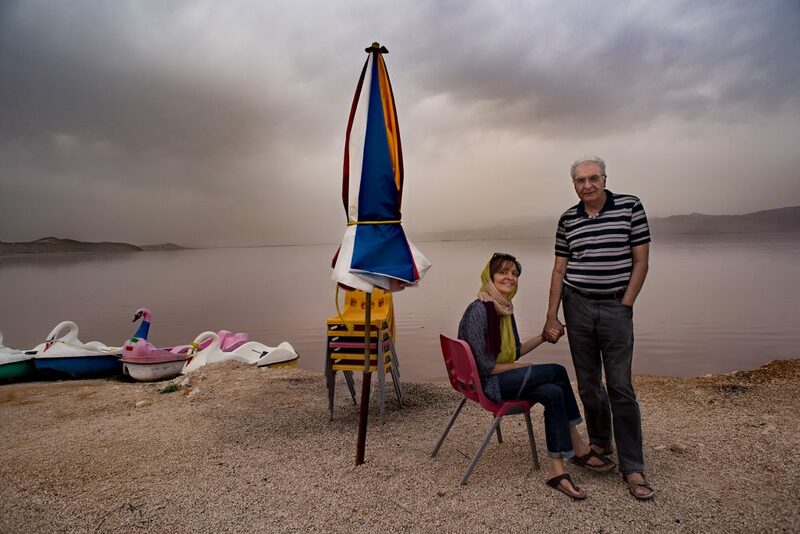 Iranian-born food author and photographer Atoosa Sepehr with her father Daryoush Sepehr at Maharloo Salt Lake, which is situated in the highlands near the city of Shiraz. Portraits of Iran is a photography exhibition which explores the paradoxes of life in contemporary Iran, taking on the clichés and getting underneath the skin of a society that is still little known and barely understood by the outside world. The exhibition at King’s College London’s Bush House features more than 30 photographs and a short film, taken between 2016 and 2018, by Dr Brian Kavanagh. The photographs reflect the breath of Dr Kavanagh’s intimate encounters with the people of Iran, against a backdrop of a falling birth rate and a struggling economy, decades of international sanctions, and mismanagement and corruption that have inflicted significant damage on a rich and fascinating culture. A lecturer in Digital Innovation at King’s, Kavanagh’s partner Atoosa Sepehr is an Iranian cook and author whose book ‘From a Persian Kitchen’ was published to great acclaim in 2018. She features in one of the images with her father at the side of a salt lake near the historic city of Shiraz. Capturing Iran’s mesmerising blend of contemporary and traditional life, the photographs range from leading Instagram influencers to an image featuring a farming couple in a remote village of Boldaji in the mid-West of the country. This striking image captures Hassan who lost his hearing after a lifetime of shooting deer with his beloved Winchester rifle; he carries it in the picture, while wife Zehra looks on. Another captures Negin, who wearing jeans,a blue headscarf and shoes to match, sits astride a bright orange Vespa scooter. She works in a cafe by day, and as a tattoo artist by night, and dreams of finding a way to unleash her creativity; but this isn’t Paris or London, it’s Isfahan. Portraits of Iran is supported by King’s College London’s Culture team and the Department of Digital Humanities, part of the university’s Faculty of Arts & Humanities. This entry was posted in Art Previews, EXHIBITIONS. Bookmark the permalink.